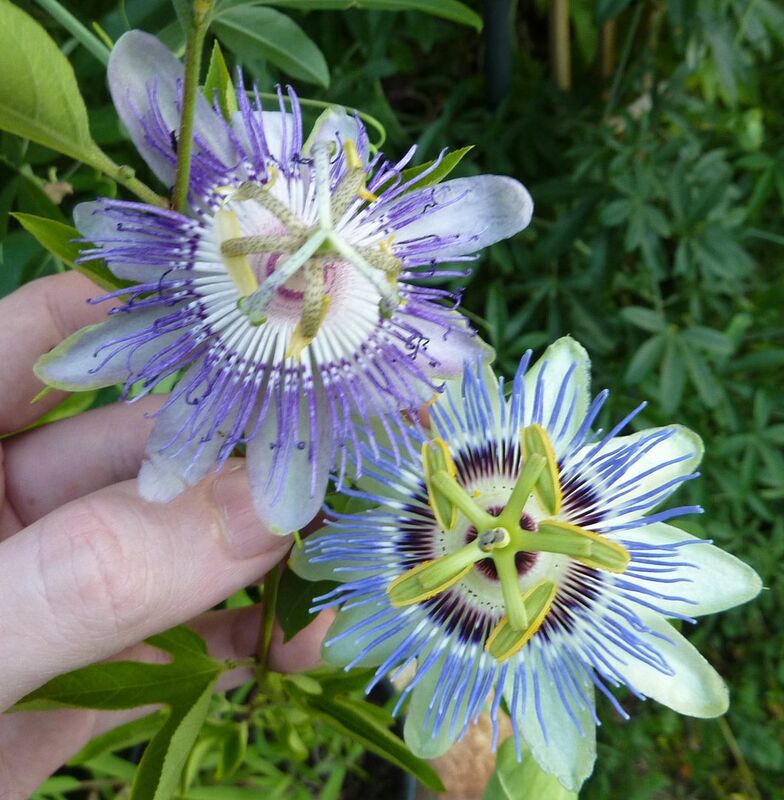 Of these three passionflowers only one is native to the US. Take a moment and see if you can guess which. You're options are Purple, Blue, or Red. The two nonnatives are commonly sold at nurseries as annuals. This might be one case where that's a good thing. 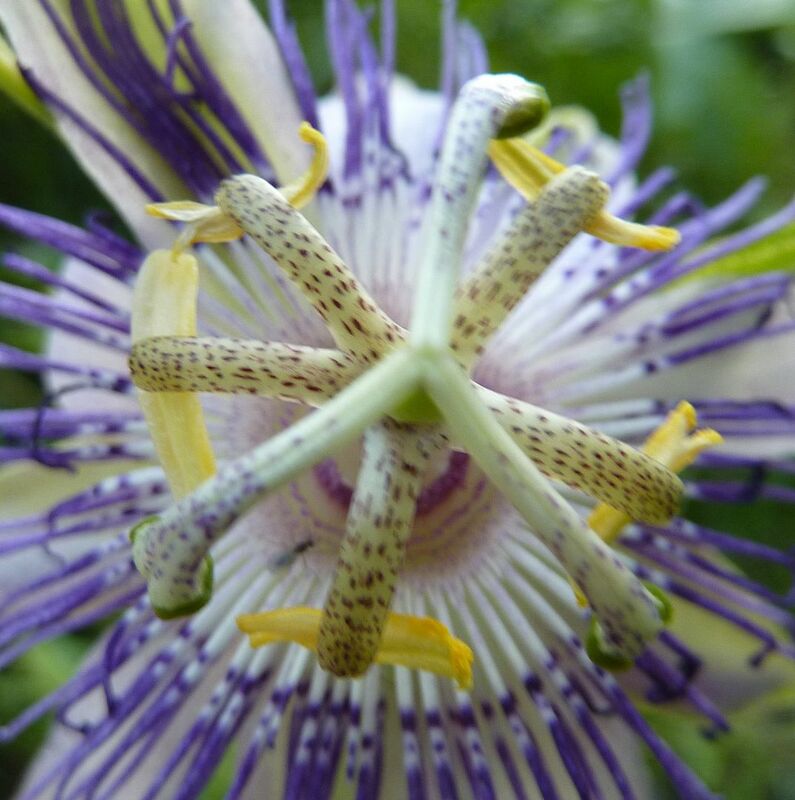 As far as I can tell all Passiflora species are noxious weeds. They come up all over the place by root suckers and tangle around existing trees, shrubs and fences. That includes the native one too. What makes this worth growing though is that they're fruiting vines. Growing them up a latices or series of polls surrounded by regularly mowed lawn can help keep them under control. Otherwise weeding will be needed. Passion fruit is sold with some frequency in stores. I've never tasted it myself but I'm told it's similar to Hawaiian Punch... which it is also used to flavor. Though oddly enough it's illegal to import any plant from this genus to Hawaii. The answer to the question is just one paragraph away. Place your final guesses now. Growing into a massive vine might actually be a strategy to help pollination. 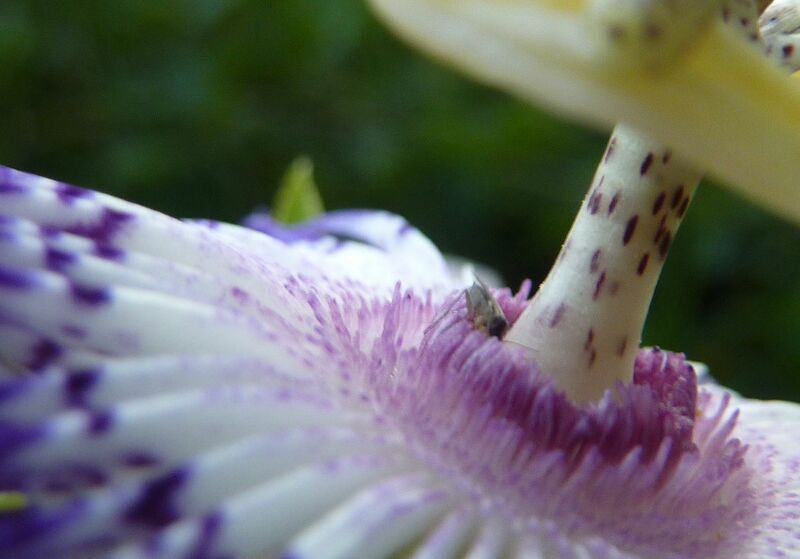 The flowers are so intricate in design that they require the anthers to curl down onto the bee's back while working. From there the pollen has to brush up against stigma to another flower to another plant. 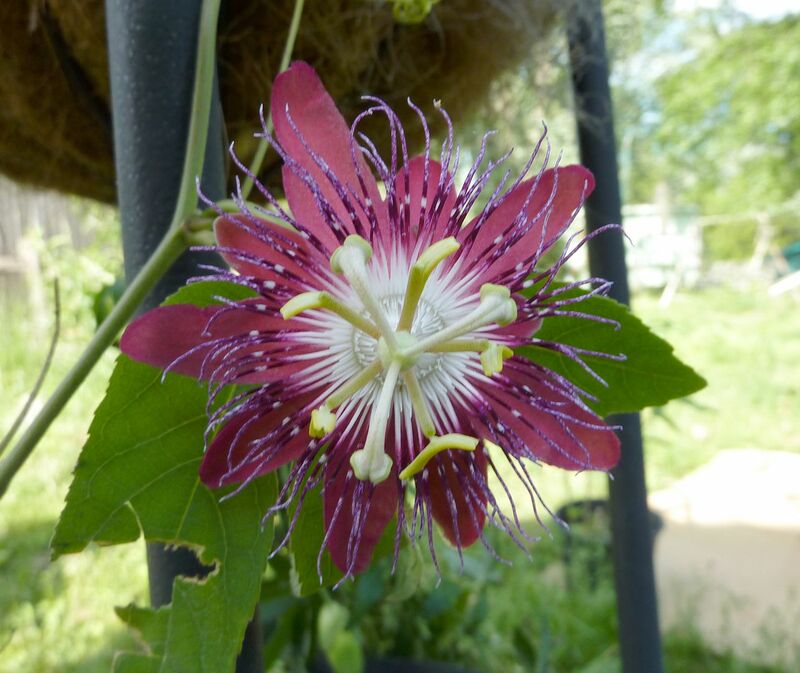 This isn't commonly done though so growing into a monster of a vine loaded with flowers helps the plant become a better sources. Hand pollinating with a small paint brush or your finger also works. If you said Blue or Red, you guessed wrong. The correct answer was Purple, and in my opinion this is also the showiest. 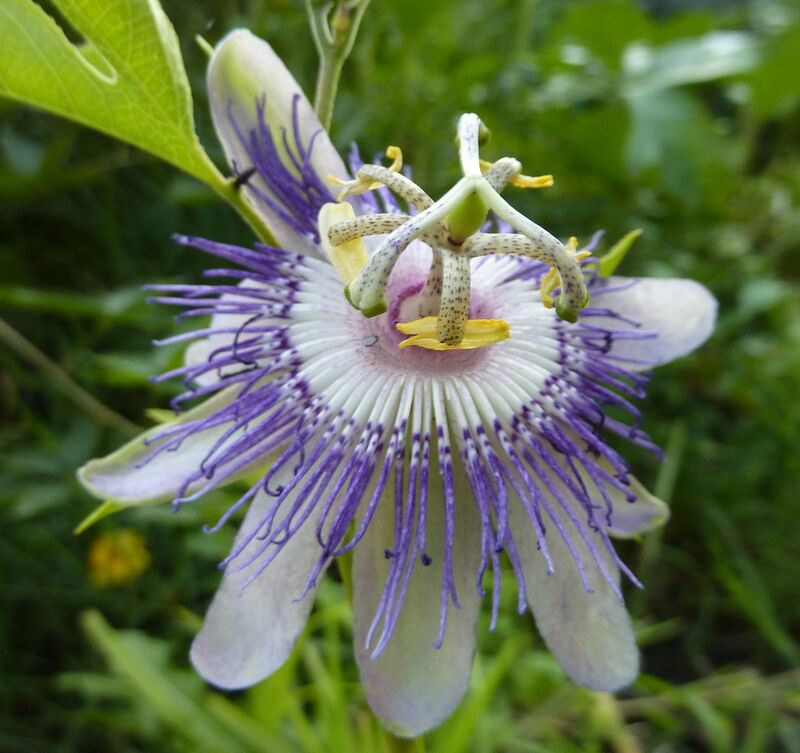 This is Passiflora incarnata, aka Maypop. I got mine from a women just 20 minutes south of where I am. She had it growing in full sun, in loose sandy soil, and boy was it taking over. She had root suckers tangling their way up the goldenrod she'd planted, and it was coming up all over. She was more than happy to give me some. You may notice that New Jersey (where I live) isn't in it's native range. For food plants I make the exception to plant nonnatives. There are so many weeds in this country that are completely edible but because we're not a starving nation so they go unchecked. Imagen if apple trees were invasive how easily that problem would be solved. I'll also point out that various butterflies that use this plant as a host are found occasionally well beyond it's range. See Gulf Fritillary. The flowers are unfortunately short lived. I believe they only open for a day (two tops) and that's it, they're done. The anthers and tips of the stigma are nicely spotted too. This is a fine detail you don't see in to many of our natives. Here, some type of small bee or fly is stealing nectar. Pollination requires the attention of much larger bees. 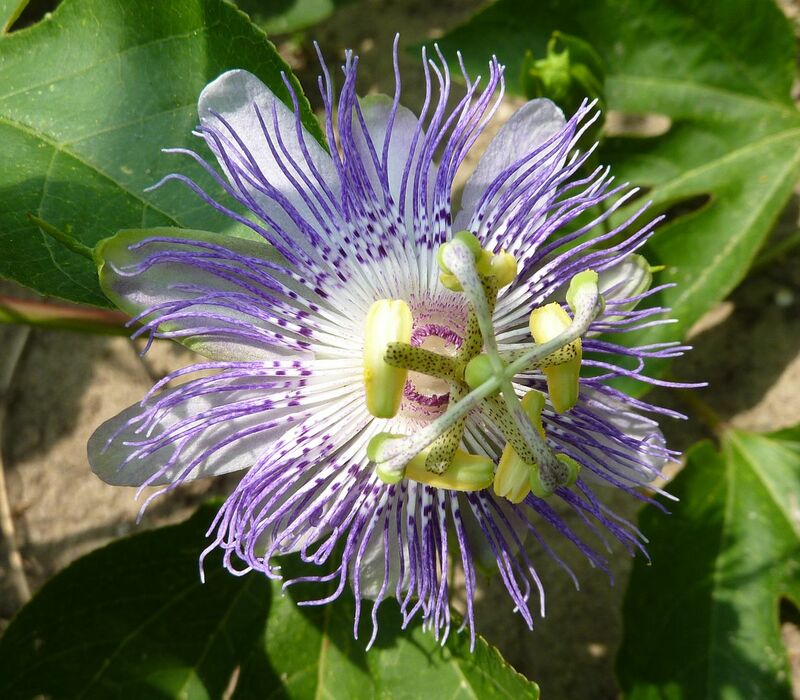 To learn more about Maypop, here's a video from Green Dean. Eat The Weeds is such a wonderful series and the world is better for having it.